In this issue, we highlight China’s ambitious plans for its domestic nuclear power sector and the recent bilateral talks between Chinese President Xi Jinping and French President Emmanuel Macron on common nuclear goals between the two countries. We also note a proposed U.S. legislation to support U.S. leadership in the nuclear industry and the development of advanced reactors and two new reports on potential growth in small modular reactors and the global rise in carbon emissions last year. China’s President Xi and France’s President Macron met at the end of March to further discussions on potential cooperation on the reprocessing plant. There is a long-standing civil nuclear relationship between France and China dating back to the early 1990s. While this plant could be used to manage China’s own considerable spent fuel it also could reprocess spent reactor fuel from its exported reactors. That raises an important question about which country would own and have access to the separated plutonium produced from the fuel treatment process. The resulting “reactor grade” plutonium has been proven to be useable in a nuclear explosive . But it is important to realize that the default alternative to America’s technology is not South Korea’s. Almost certainly South Korea would not be able to export the reactors it is currently building in the UAE without a U.S.-Saudi 123 nuclear cooperation agreement that would pave the way for U.S. technology export. There is significant U.S. technology in the Korean reactors. Without an agreement and its Congressional approval, France, China and Russia are the best positioned bidders for the Saudi’s business. The geopolitics of the global export nuclear market are shifting, and new dangers are emerging that may not be adequately apparent to, or appreciated by, nuclear experts and policymakers. Russia is dominant now, but China is making all the moves that are required to unseat it. Both nations’ nuclear industries are state-controlled and fully integrated into their geostrategic objectives. 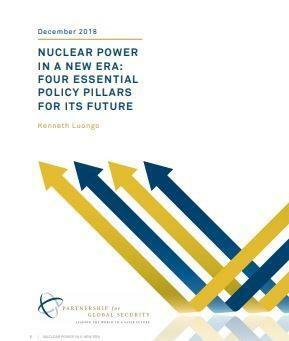 Report Release - "Nuclear Power in a New Era: Four Essential Policy Pillars For its Future"
There is a strong case to be made for the societal value of nuclear power in the 21st century that is compelling and globally important. Estonian energy company Fermi Energia signed a Memorandum of Understanding (MOU) with UK-based Moltex Energy to work together on the siting of a Moltex advanced reactor and the development of a licensing regime, as Estonia plans to establish carbon-free energy production in the Baltic region. China could build up to eight reactors annually if the country returns to a standard approval process, according to CNNC Chairman Yu Jianfeng. China approved two new nuclear reactor projects earlier this year, ending a three-year pause in conventional nuclear projects. Separately, the CEO of CNNC said China now favors the development of its Hualong One reactor over western reactors for the Chinese domestic market since they will be faster and easier to repair and maintain. At the 2019 Spring International Summit at China’s Nuclear Energy Sustainability Forum the Chairman of China National Nuclear Corporation (CNNC), Yu Jianfeng, highlighted Chinese nuclear technology exports to Pakistan and stated that the conference aimed to promote international cooperation on nuclear energy in the Belt and Road Initiative. Chinese President Xi Jinping and French President Emmanuel Macron discussed common goals for nuclear power and for the fight against climate change in bilateral talks held on March 25th during Xi’s three-day state visit to France. Macron’s statement specifically mentioned the long-awaited joint project to build a reprocessing plant for China’s used nuclear fuel. Energy Secretary Rick Perry has approved seven Part 810 authorizations, allowing U.S. firms to share nuclear information with Saudi Arabia. However, this has raised some security concerns among lawmakers which could create more delays for Saudi Arabia’s nuclear program, in order to ensure that Saudi Arabia is meeting international nuclear standards. Due to security concerns, U.S. senators from both parties have asked Energy Secretary, Rick Perry, for details on the recent seven Part 810 authorizations with Saudi Arabia. Recent satellite images show that Saudi Arabia is close to completing its first nuclear reactor. Robert Kelley, former International Atomic Energy Agency (IAEA), stressed the importance for Saudi Arabia to create strong safeguards. The International Atomic Energy Agency (IAEA) announced it will hold the third International Conference on Nuclear Security: Sustaining and Strengthening Efforts (ICONS 2020) in Vienna, Austria from February 10th to 14th, 2020. The Nuclear Energy Leadership Act was reintroduced to the US Senate. This Act aims to reestablish U.S. leadership in the nuclear field while ensuring advanced reactors can provide clean, safe, affordable, and reliable power to meet national and global needs. Bill Gates, a supporter of nuclear energy and founder of Terrapower, is ‘thrilled’ by the legislative boost. The U.S. Department of Energy announced that it will fund four domestic advanced nuclear technology projects for a total of $19 million, to advance U.S. commercial nuclear capabilities. Separately, Energy Secretary Rick Perry issued a $3.7 billion federally-backed loan to continue the construction of the Vogtle nuclear power plant (NPP) in Georgia after years of cost overruns and project delays. Idaho Power plans to retire its coal power plants and generate all of its electricity from renewable sources by 2045. The company is also planning to acknowledge the possibility of using new technologies for clean energy, including small modular reactors (SMRs). Utility executives voiced support for nuclear power at the annual Bloomberg New Energy Finance Summit. Xcel Energy CEO Ben Fowke stated that nuclear is essential to a carbon-free electricity system. From March 25th to the 29th, the Nuclear Energy Institute (NEI) hosted the second “Nuclear Innovation Week,” where leaders in the nuclear industry gathered for discussions on the advancement and deployment of advanced nuclear technologies. To kick off the week of events, President and CEO of NEI, Maria Korsnick gave a briefing on the bright future of the nuclear industry if it receives needed investment and policy support. The UK Department of Business, Energy and Industrial Strategy (BEIS) released a new report stating that SMRs could provide up to 2,850 megawatts of electricity for the global market by 2030. According to the latest report from the International Energy Agency (IEA), CO2 emissions rose 1.7% last year and hit a new record, demonstrating that immediate action is required to develop clean energy solutions. For more than two decades, the Partnership for Global Security (PGS) has developed actionable responses to global security challenges by engaging international, private sector, and multidisciplinary expert partners to assess policy needs, identify effective strategies, and drive demonstrable results.